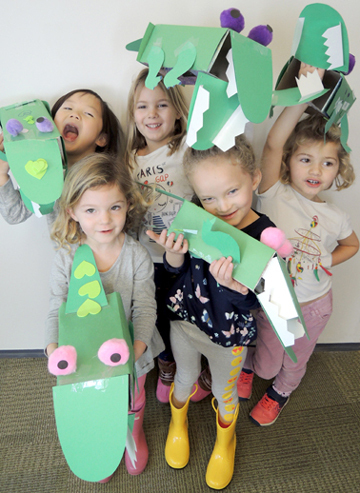 These snap-tastic alligator puppets are adorable…and hungry! But what do you feed a story time alligator? Literally, anything! We read Suddenly Alligator, written by Rick Walton, and illustrated by Jim Bradshaw (Gibbs Smith, 2004). When a young man’s socks hit the 3 month “no wash” limit, he heads to town to purchase a new pair. Along the way, an alligator gives chase. Nothing in the boy’s pockets seem to thwart this ferocious beast, until the alligator gets a whiff of the boy’s socks. Much to his relief, it knocks the alligator right out! In addition to hilarious illustrations of the ferocious, relentless alligator, the book ends each section with an adverb – anxiously, cautiously, hungrily, boldly, desperately, fondly – making it a fantastically funny read aloud. 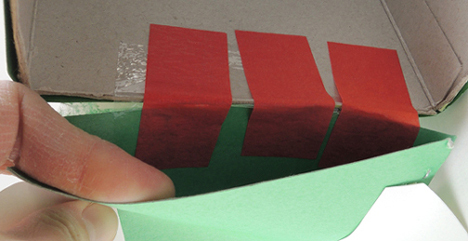 Repeat the above steps with the bottom mouth pocket, then add card stock teeth to the mouth. To operate the puppet, slide your fingers in the top mouth pocket, and your thumb in the lower mouth pocket. Here’s the finished alligator…we used green construction paper for the body, and green poster board for the legs and tail. 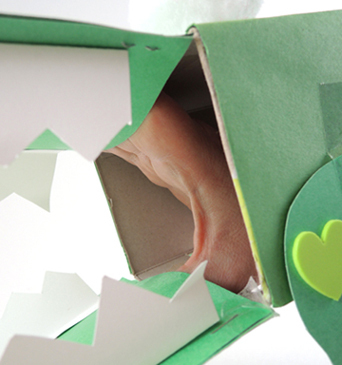 Notice that the legs dangle off the bottom of the box with tape hinges – the puppet sits better in your arms that way. The eyes are jumbo pom-poms with dot sticker pupils (paper circles work too). 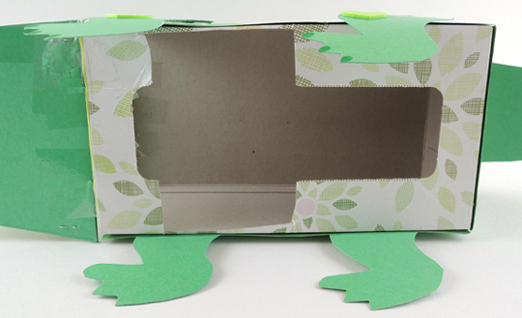 We also offered green self-adhesive foam shapes for additional texture (or just use markers). Each kid got to take home a plastic ball for the alligator to consume, but as the kids milled around the gallery, the alligators started eating EVERYTHING. Scarves, pens, socks, hats…if it fit in the box, the gator consumed it! 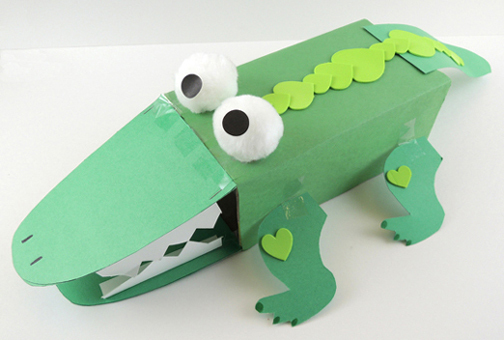 This entry was posted in Picture Book Projects and tagged activity, alligator, art, children, craft, craft project, eat, how to, instructions, interactive, Jim Bradshaw, kids, library, literacy, program, puppet, Rick Walton, story time, story time project, storytime, Suddenly Alligator by Dana Sheridan. Bookmark the permalink.